Kathy Milhauser mentioned that she assigned Digital Habitats to students in a course on globally distributed project teams. That got me thinking about the difference between a project team and a community as far as their digital habitat is concerned. Of course there are many project teams that have spawned communities and many communities that have launched projects, so there are many connections. When a project begets a community it’s often because the sense of accomplishment that people have sparks that sense of recognition of each other’s expertise and people feel that they need to stay connected to each other. I was on a team at StorageTek in the ’90’s that designed and produced a big learning event; afterward we staid in touch, got together frequently and looked for more work along the same lines. When a community launches a project, it could be to produce an event, to explore a topic, to standardize a practice, or to provide the community with a technology advance. For example, when Beverly Trayner agreed with me to head a the project to hold a dialog in Setubal in 2002, there was a clear moment when she announced that “project team rules” would apply, not the discursive, relaxed, “let’s think and talk about whatever seems important,” and “everybody gets their say,” approach that had previously prevented us from meeting face-to-face. Who is on a project team is not always as clear as we’d like. Sometimes a key resource or contributor will be part of the network or surrounding community but not part of the formal project team. When the knowledge and skills required for a project are very cutting-edge or very diverse, project team membership sometimes can’t be known in advance, much less specified. All of the discussion about permeable community boundaries will apply in those situations because team members may need to bring an expert into a few technology-mediated conversations, not involve them in the whole project’s work-space. During the project of writing Digital Habitats, Nancy White kept repeating “Technology is used collectively but experienced individually,” (or something to that effect) till Etienne and I could say it on cue. In my observation, communities are expert at dealing with the differences in people’s experience of technology and somehow inventing ways of bringing people together despite the obstacles. Even when a community isn’t sponsoring a project, sometimes the community is the critical sounding-board or peanut gallery for the project. Unless the project team pays careful attention to the larger community’s conversations, the project will fail. For a distributed, technology-mediated team that may require that project team members stay involved in the conversations or activities of that surrounding community (which have more fuzzy and ad hoc technology boundaries than what we normally think about as “the project area”). When you observe projects in real life they are quite diverse, not just the instantiation so many Gantt charts. If we look closely we might find projects that are oriented toward “meetings,” “open ended conversations,” or “access to expertise,” or “relationships” much like the orientations for communities that we propose in Chapter 6. If those orientations have technology implications, the surely the orientations in projects must also. Finally, when a long-running project team experiences member turn-over, there’s a need to bring new members of the team into the team’s culture and tell them the stories from the team’s history. That sounds like the time for community thinking to me. Bottom line, there is more self-selection going on in project activities than an “everybody is on task in this project” kind of perspective would suggest. Of course there’s the question of whether project teams can learn more from communities or the other way around. Thanks for considering this perspective John! The students in the Leading Global Project Teams course are discussing the differences between communities and project teams this week in class, and are beginning to put together technology strategies for a simulated project they have been assigned. Indeed, thank you John for allowing our class to have this digital discussion on your blog! As you compared project teams and communities of practice above, and in Digital Habitats, I could not help but think that the main difference between the two groups is level of engagement. I’ve always been interested in the amount of choice involved in project work versus open source work, for instance. While employees who participate in projects have the choice to abstain (in the form of resigning from the company, at its extreme), I believe there is a different level of dedication by members to communities of practice. Take for example open source projects in which developers dedicate hundreds if not thousands of hours of their personal time to the development of a product for which they will never be paid. I would suggest that the open source movement, as a larger-scale community of practice, manifests a devotion unmatched by even the most dedicated employee of any company. Do you think that an employee in a project has a more neutral level of engagement, and therefore is more flexible in adopting different technologies, than someone who dedicates their “heart and soul” to a particular effort? Well, the amount of passion that people bring was certainly on my mind when I wrote that post, Karen. But I think it might not be an absolute difference as much as a useful contrast. It’s probably impossible to measure, but my gut tells me that the passion around some projects in some companies is greater than the passion around some communities in other companies. And I think passion translates into inventiveness: like “Hey, let’s try this tool!” or “Hey, let’s think about THAT (which has massive tech implications for the group)”. I’ve read the first chapter of Digital Habitats and look forward to the history communication technology in Chapter 2. I’ve also got a magazine on my desk that summarizes the top 10 advances in technology in the last 10 years or so- things like smart phones and such. I’m not an early adapter of new technology. I would say I’m usually about 10 years behind the leaders. For example, I feel I can do everything I need to do at my work with a fileserver and MS products and hyperlinks. I don’t like websites or SharePoints unless I have to get some business done like check on my medical benefits. I don’t even like cell phones. But I realize that my attitude will have to change as I become more involved in the world. So I look forward to learning more about the concepts of domain, practice and community, communities of practice (but no communities of domain? Mmm…. How about communities of domain and practice? Anyway, I first heard the term community of practice here at Boeing. Someone was trying to capture Boeing knowledge in a virtual library. The leader set up weekly webex meetings and rambled on about this and that, but it was a one way street, and the ideas didn’t captivate me- I already know of other methods that worked better and didn’t cost a dime. The leader already knew everything, as such was not capable of learning anything new, so I stopped attending these virtual meetings. Then we also have something called the project management interest group at Boeing. They hold regular webex meetings as well with different speakers on various topics. I like this variety better, but I still find it hard to “get involved” virtually. What I can tell you is I really like the CityU methods of a combination of in-class experience and discussion board via the web. I’ve found that the questions on the DB have to be interesting and the group size has to be about 10 to 15 people in order to be engaging. The point of this post is to let you know what my experience is. This is just the beginning for me in this area even tho I will finish my MSPM degree in DEC-2010. Look forward to the discussions here. I think the point of the Digital Habitats book comes down to: follow the conversation, the energy, the usefullness, the fun of it. The technology serves that not the other way around. And I agree with you that combining connection styles is really where it’s at. Once you get a chance to meet face-to-face, a tech-based discussion is more fun and more productive. Did you or anybody give the “know it all” grief or did you just silently put with him / her? I know I’ve kicked myself afterwards for silently putting up with know it alls, even though they take all the joy out of a group. Thank you so much for taking the time to discuss your wonderful insights regarding project teams and technologies for communities. I feel that technology and other digital forms have been the “cornerstone” of our lives. Our access to all types of digital media these days is giving us a greater variety of communication mechanisms, but at the same time, there are times when I begin to feel disconnected or disengaged, and I begin to get frustrated because I can’t really express myself more clearly through technology. For example, I’ve volunteered myself as the meeting facilitator for our project team in my other class (Project Integration) this quarter. Our project team consists of group members spanning all across North America, including Canada. At first, we were just communicating via email and discussion board, but then I brought up the idea to hold a weekly teleconference call so that we could hear each other’s voices and ask questions in “real-time”, not having to wait until someone would log into their email or check the group discussion board. In one of our earlier telecon meetings, a couple team members were very frustrated with the direction of our project. You could sense the frustration in their voices and although we were just on a phone call, the level of tension was extremely high and there was this aura of discomfort throughout the meeting. On top of that, as the team members were going back and forth trying to support their own opinions and thoughts on our project, there were blocks of silence in the meeting where there were no words spoken and this made me very uncomfortable. Ok, so after all that background (my apologies, I tend to ramble on and on! ), I guess my question for you is, do you think there are situations and cases where digital learning and digital communities can be a hindrance to making a team work effectively towards project goal? I guess part of me feels as though the frustration and issues could have been lessened if we were conducting our group meetings face-to-face and we were able to see each other’s body language and facial expressions or gestures. Sometimes I feel as though a lot is lost in translation when it comes to conducting meetings online or via phone or instant messenger. Also, can you offer me some further insight for working through projects and “virtual teams” in an effective manner in such a way that promotes a positive learning experience for everyone involved on the team? I know full compliance from all team members can be a stretch at times, but for someone like me, I am always looking out for others best interests and their overall experience in the working group in general. Thank you for letting our class take a “field trip” to your blog. As someone who does not come from a technology field per say, it’s nice to experience new concepts and ideas that may turn out to be a solution to a problem I’ve been trying to solve for years. 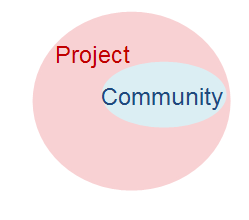 Your ideas of why a community perspective would be useful for project teams is a real eye opener. As a team you feel very connected and familiar with the individuals over time. The term community doesn’t necessarily bring that same vision home. Although with the new advances technology brings, there is always a new way to reach out to those members of a community and stay connected. I am thinking of things like Facebook, Twitter, Sharepoint and wiki pages as a way to engage the masses whether they are familiar or not. As project teams start to develop these types of tools to help manage or communicate throughout the life of the project, they are drawing in more of a community perspective than just the team members who are engaged due to other reasons. So I see the connection you are making between communities and project teams because it is something that is already happening whether we know it or not. Your blog really makes that connection seem apparent as I have never looked at it in this way before. Thanks again for allowing us to be part of your blog. Thank you for taking the time to interact with our class discussion for this week. I am sad to say this is my first time blogging. I will have to say it’s a lot like this program we use in school called blackboard. It’s not nearly as complicated as I thought it would be. I feel that technology is heavily relied on, and is continually changing. Every time I learn how to use a program it seems like it changes or a new program comes out. There are so many different options available to communicate, and many see this advancement in technology as a great opportunity, but I see it as very frustrating for two reasons. First, I am a people person and I am so much more effective when I am able to interact face to face with someone, I think most of these technologies take out the people side to things and have changed the way people interact at work, school, and relationships. Society has gotten so accustom to interacting in every way besides in person, causing face to face interactions to become a thing of the past. Second, not all types of technology are user friendly and you have to learn so many different types of programs, and once you figure it out there is an updated version, this discourages me from wanting to even use it. Socially it’s been hard for me because my generation is all about cutting edge technology so I get teased from my co workers, friends and family for not knowing as much as I should. Okay enough about my technology phobia. I really appreciated the points you made about a project team and communities digital habits. Some of the points you made relate to a team project we are working on, it helped me to realize some things that relate to cultural and technology when going global and all the elements that have technology implications. I think we need to pay attention to whether we are thinking in a “glass half-empty” vs “glass half-full” syle. I notice in your story that the stony silence did result in insight and better collaboration. Isn’t that right? I just don’t think that any technology or way of interacting is a complete substitute for any other. Our palette of choices just gets bigger and more complex. Thanks for responding from your conference in Columbia. We have been discussing the role of constructive conflict in this class, so I am glad that Christine shared her story. I think most of us would agree that face-to-face contact usually facilitates the best communication, but then again, if we were relying on f2f for this discussion, it wouldn’t be happening! In the spirit of “glass half full” I like to remind myself of all the relationships I would not be able to maintain and all the colleagues I would struggle to collaborate with if I did not have technologies available to help bridge the gaps of time and distance! Thanks for responding to our posts! Appreciated! This certainly does highlight the importance of the two types of relationships, projects and communities, and HOW they relate to one another. I would aruge that the most prevalent structure is one most like your second graphic there, but with the Project more enveloped in the “Community” bubble, the community bubble driven by technology. When we talk about the breakthroughs (mainly interaction availability) that the internet and technology has has on projects, I believe it exists to the point where there is always a level of technological community established in an organization. You cannot escape it. It has become pervasive in the business culture, as everyone works on their computer throughout the entire day, and with global team members around the world, you may never meet them face to face. In my mind, this creates communities everywhere, mainly a large, top level, corporate tech community. It is within these communities that Project must be created, run, and managed. A project leader can then take advantage of the networks/communication-mode within the community to run the project, but at some level, I think there is always a interconnected community. It would be rare to find someone outside of this. What is the connnection between this blog and Twitter and the guy with the shades? What is a Chat Catcher? Where am I? I don't have any pants on and for all know someone may be watching with a "Chat Catcher". That's "bad yikes"
Chat-catcher is a plug-in for wordpress blogs. It scans a twitter-feed for references to your posts and inserts them as comments in your blog. It’s a low cost way to gather responses to what you’ve written. Although the resulting contributions are not substantial comments (like the ones that your class have submitted) the comments are usually interesting and I”ve found that there is a low proportion (or NO) SPAM as a result. Thanks for sharing your comments/thoughts on the community of practice and how it applies to project teams. As for myself, I would claim to be a big supporter for using technology forms such as email, web-ex, SharePoint sites, and instant messenger for communicating in a project team setting. The reason why I say this is that it allows us or an organization to expand its business globally. I work in Supplier Management at the Boeing Company and we worked with different vendors from different countries on different time zones on a daily basis. Having this technology form to communication makes my life easier. When we’re up and working over here in the United States, our key partners are resting away and vice versa. I think emailing each other on work-related business help eliminates some of the frustration with time zone differences. Also, if there’s an urgent issue that needs to be addressed immediately, we could easily set-up a web-ex meeting and audio conference to work together to resolve any issues. This is a good example on how we closely work together without having a face to face meeting. This cut costs down and save a lot of time on both ends. Moving towards a digital habitat is big advantage for big corporations to expand globally. Based on my comments above, John, what are your thoughts on this? Do you see big corporations taking advantage of this “tool” and attempting to take the opportunity to grow globally? Thank you for taking the time to participate in our field trip. In my current organization we have a fairly large generation gap within the various teams. The ages range from late twenties to early thirties and then there is the gap as we pick back up at mid forties to late fifties. As we look to streamline processes and allow creativity to guide new and more efficient ways to do business, technology becomes a big roadblock for the older generation. The move to wiki’s, blogs, and online organizational newsletters, have caused communication between the ages (for lack of a better term) to cease. It seems to have increased the gap instead of reducing it. For projects and programs, more and more teams are moving to using SharePoints for sharing information, and there are a few who just can’t/won’t move away from the paper trail and move on to the digital train. What experiences can you share that may shed light on overcoming this impasse? What I have seen as a challenge with technology with our project teams is that as our project and programs move to SharePoints, Wiki’s, group web pages, we bring to the forefront the generation gap in our groups. In my organization in particular, there is a huge gap. We have the fresh from college, tech savvy employees, and then you have the remainder of the group that start at the mid forties to late fifties, early sixties and no buffer in the middle. As the new ideas for sharing information on Wiki’s, blogs, and SharePoints there is a huge resistance to move to these new practices. Can you share some of your thoughts/experiences on overcoming this barrier within teams? I wonder about the generation / technology gap thing. I think it’s mostly a myth. Mostly people figure out how to use the tools that are available to do what they want to do. In some companies technology has been a very top-down kind of thing: you use what you’re taught to use and the IT department works very much like a gate-keeper that determines what’s allowed. So that keeps people’s options narrow and their skill-set is constrained by what’s allowed. But the idea that digital natives are somehow more skillful and hip with technology while the immigrants (older folks) are not skillful seems bogus to me. It’s like the myth that people bought into that men were good at one or another corporate role and women were not. Come to find out the average difference within groups vastly exceeds the average difference between groups: similarly there are many older people who are vastly more competent with technology than many younger people. With respect to over-reliance on technology and the tendency to avoid direct contact while relying on, say, a SharePoint space for project coordination, I would look for other causes (in addition to relative comfort with technology). Part of what we’re trying to do in Digital Habitats is show how one tool doesn’t do everything or meet every purpose. You have to think about what kind of communication, what kind of “being together” you need, before you decide which tool. And come to find out you probably need a SharePoint space and regular phone calls for team meetings used according to some purposeful rhythm. I would ask you: are there motivations or power struggles that are behind a “paper trail” orientation vs. a “technology only” one? The reason your post didn’t show was that I was in a conference in South America and, unless you register on this blog, I need to approve each posting. Helps keep the SPAM out. Now your post is there twice. The technology gaps that exist between groups in your team are an example of a pretty clear learning need in a project. So maybe you could get a bit of a community going around the uses of technology within the project. The point would be to legitimize an occasional show and tell session about a tool either as part of a project team meeting or as a free-standing initiative. To keep things even, you might have to devise ways to balance teaching privileges so that the tech-have-nots don’t feel completely spoken down to. I have. In an on-line forum of car enthusiasts I introduced myself, my interest and my vehicle. I was immediately corrected for using terms in a different manner than was the community standard by some of the know-it-alls. I left the forum and never returned even though they might have had some useful information on rebuilding my carburetor. I find on-line communities interesting because like real communities you get core areas/members, outliers, passive participants and even occasionally riots… err… flamewars. Yet current technology allows us to link, direct, edit, and educate ourselves. I think your experience with the car enthusiasts forum is a great example of how important it can be for a community (or an organization that sponsors the community) to “keep it friendly.” I think the same thing applies to projects, don’t you think? If a project develops a really negative culture, everybody loses. And come to find out, although technology enables more global project teams with more diverse skill sets collaborating in new ways and all that good stuff, it also makes it really easy to magnify the lapses or negative behaviors of just a few people. It takes guts to pay attention to the culture and protect it. Like everyone else, I thank you for volunteering your time to blog with us. It’s a rare event to blog with an author of a critical course text. 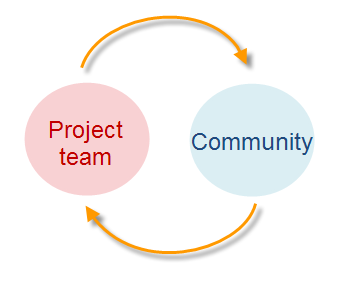 I like the discussion of the community of practice with relation to project teams. I also enjoyed discussions regarding the passion of the community versus the goal-oriented minds of project teams. I wanted to ask another paradigm to this, organic team structures in start-up companies. I know this steers away from project management and community, but most organic teams and start-ups frequently exhibit passion, yet the individuals work and respond in a manner consistent to upholding their company’s survival. In some respects they are goal-oriented as project managers but they have passion that is parallel to a community of activists that firmly believe in their values. How do you feel organic team structures in start-up companies rank in the technological adoption for continuing their passion but yet not losing site of immediate goals? Basically how do they rank between a community of activists to the mindset of goal-oriented project managers in the context of technology for communities? I feel some of the organic teams that were start-ups, heavily utilized technology community-like activism during periods of expansion. They used technology communities to stay true to their core values (a parallel analogy to project goals executing on a firm’s mission statement) and foster a brand that is lived through day to day thought processing of participants in-line with the company’s identity. I have also heard of some organic teams using technology communities and its associated tools (wiki, sharepoint, newsletters, individual profiles, etc.) to leverage scarce resources amongst the company. For instance: leveraging an individual’s talent mentioned on their profile page to create a music marketing/ media page for a weather network. This is where the technology community helps enhance project manager’s selection of team contributors, yet illustrates how small organic team structures in the start-up phase share resources amongst a thin base. I think your comparison between “organic teams” in a start-up versus the more formal teams that are common in a large, mature corporation brings up some really interesting points. My impression of what you mean by an organic team is that somehow “everybody knows what we’re about.” In a community of practice, if you don’t know what the community is about, part of your job is to figure that out. In both cases, it seems like passion guides intuition, so that people trust themselves to figure out how they want to work together (including figuring out what technology to use at a particular point in time). Activists “share the faith” and so it can feel like everyone knows what to do with very little communications or control overhead. I think the main point here is that you can go too far in either direction. If a community or a project team are too much guided by convention or by tradition or by what someone tells them to do, they can miss a lot of opportunities for successful collaboration. On the flip side, communities and project teams can spin out of control, wasting a lot of time sampling technologies or communication experiments. In our orgnanization’s blog/newsletter, they have now allowed members to post “anonymously”. To a certain extent this has opened up the amount of activity on the blog as people feel insulated from public criticism on their contribution to the blog. I am not sure I necessarily agree, since this is a change in the original ground rules when the blog was established and people should be comfortable enough to stand behind their opinion. Like a face to face community -if you want to be heard, you stand behind your point when you want to be heard. Thoughts? Anonymous posts can be tricky — and so can changing the rules! I think it all depends on your purpose. What is the blog trying to achieve and what are the alternatives? If there’s no other way to gather anonymous comments, then the blog with anonymous posts may be the way to go. You might consider having two different blogs — one with anonymous responses and the other not. Then compare the two. What’s the goal? John, I appreciate your insights on all our individual situations. 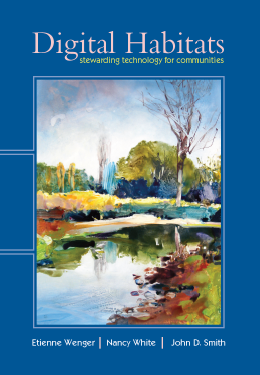 My thoughts on the subject of technology stewardship lean more towards the introspective. Over the years I have developed a love/hate relationship with technology. The idea behind it is to make our lives simpler and easier yet the problems it solves seems to create new ones. As a result I am very slow to embrace the new forms of technology including in the communications field. I don’t have a facebook account, texting has been a last resort, and this is my first every blog review and posting. These items fall in the personal realm, but the slow adoption of technology idea reaches into my professional life, too. I consider myself open to be taught new ideas and will to my best efforts, be a team player, however, I find that I won’t go out of my way to keep up with the latest and greatest tech inventions. I can see this being a hindrance when it comes to performance on a global team. I also recognize that my personality would be more difficult to work with on these teams, as my knowledge base surrounding communication innovations would be very limited. Using terminology from Chapter 5 of Digital Habitats (Wenger et al. 2009) my technology literacy could use some improvement. My question to you is, if you had this type of personality on your team, what would be your strategy in engaging that team member? What type of responsibilities would you give them (or avoid giving them) to ensure they could be an effective contributor, yet push their comfort boundaries at the same time? Thanks for responding, yes…. I come from the old school…However, the use of technology and the advantage it has given us for outweight the misgivings as an old timer like myself. I was reading on chapter 3 on technology steward. It was talking about the big impact in has on improving the community. It serves multiple communities within, across or outside the organizational boundies. It has definitely aided me in learning new tools for communication and presenting new ideas to my class-mates. I was talking a risk management class dstance learning, one of my class mates in my project team live in the Bahamas, the other team member live in Hawaii and the other team member live in seattle, but was communting from Australia to Seattle. You can understand the challenge it was connecting with all of them at one time. One of my co-worker shared an interesting story, When he taught agriculture classes at high school vocation, many of the techers taught a combinations of classes to the students. So any new courses that came down was recieved online from University of Montana and shared with the rest of the teachers in aiding them in preparing the classes for the students. One of the kicks, I had enjoyed becuase technology is the use of cell-phone…It has made the world seem so much smaller. I remember listening to NPR, to this Irish writer, He was mentioning back in 1800 to early 1900. the only way you see your relatives who live in Europe was to write a letter to them or sail across the Atlanitc to visit them. Now all you have to do is to email them or call them on a cell-phone. So the conception that the world is this gigantic place has been reduced by the use of cell -phone, email and the computer. It is interesting as a culture of people we now know and see how other cultures or people are being treated by the use of technology. We have seen the riots in China, with the students being ran over bulls-dozer. So the use of technology has been a concern for many world leaders. they can no longer hide the abuse they in-flick on their people w/o restricting the use of cell-phones, cameras, even in Iran we see people protesting. Sorry if I was so long winded….This has been fun. I read and re-read this a few times. I find it very interesting that the community can pull ideas towards the project team, but that the project team would be hard pressed to push ideas towards the community. It seems like the community, therefore is critical to the success of the project team. Also, the last part you talked about with team turnover and having to give new members history. I have been on teams that have had a lot of turnover and it can become a very ugly thing. How the history is rolled out to the new members, and choosing what is really important even to be told; this can really either dictate the success or failure of the continued team. The team would need to be very strongly attached, and solid and have a lot of trust in each other to be able to add members and not have the momentum of the team diminish. I’m wondering what exactly you mean about “project teams being hard pressed to push ideas toward the community.” Maybe I need to do some careful re-reading, too. It seems to me that anything is possible, and everything does happen out there. For example, communities can be strong in their resistance to what a project brings to the table. Whether you think that’s a good thing or not usually depends on your point of view. Sometimes the community holds really important institutional memory that people on a project ignore at their peril. On the other hand, I’ve seen communities that just dig in their collective heels and resist anything new. It’s like there is a somewhat different logic: I would say that communities often have longer memories than project teams. That said, it often takes effort for communities to lug around their scrap-books and other artifacts as their technology platforms evolve, get replaced, and are abandoned. We’re not talking about simple things here. Thank you for taking our questions. This is my “first” blog. My question involves how you get a business unit to use all of their resources to their fullest extent. I work for Boeing in the Program Planning and Control (PP&C) group. There are about 250 people within our Business model. At Boeing we use several different technologies for our projects. This works well when we are working on a special project such as a quarterly budget. We use Share points and Wikis to inform the managers of their quarterly budgets. This works out great. Everyone knows where to go to find their information. Currently, we have about 1/3rd of our staff retiring in the next 3 years. This is a big problem since much of our group knowledge is not written down. We are currently hiring people and training them, but we also need to work on teaching more than one person a job. We need a place to go to “transfer knowledge” within PP&C. We have set up a Wiki. The leadership of the group wants us to use this, but it doesn’t get used at all. Most of the teams within the group just teach their new person. It can no longer be just a team project; it needs to become a PP&C community project. Hi, Jennifer: you’re asking a bunch of interesting questions. One little trap that I can see is asking “how you get a business unit to use all of their resources to their fullest extent.” Especially when we’re thinking like change-agents (like you, taking this class which stretches your thinking, posting on a blog for the first time, wondering about all the possibilities, etc.). We naturally think in terms of “getting the most out of technology.” But what Digital Habitats is about is figuring out how not to put the cart before the horse: trying to help people think about what a community (or a business unit, in the case of this posting) needs and then figuring out what technology would help. And that includes figuring out what extent the resource could be used productively. I think that just having a tool like a wiki by itself will not help with impending retirements. Wikis, for example, are not so “participation-oriented” in our diagram on p. 60 and they’re mostly asynchronous unless people have either a good reason or a lot of passion for the subject. Can you think of ways to give the retiring PP&C folks some kind of motivation to share their knowledge? A way to sound a drum-beat (like the budget cycle)? Look for a way to make it fun for them to interact with people in a way that spreads what they know around the whole group. I think this is a great example where we could use what we’ve learned from communities of practice about knowledge sharing (where it’s voluntary, the dynamics are easier to figure out) and apply it to other settings. Whereas CoPs are more voluntary and facilitated. So even though they use the same tools, the tools don’t define the dynamics of the group. I agree that the social dynamics always trump the design of the tool. The way a tool is used can scoot it around the technology landscape. It strikes me that software tools usually have someone who tries to brand them so it’s easier to name them. But the social dynamics are constantly evolving and most people don’t care what they’re called. So it’s kind of a riot out there. Thank you for allowing us the opportunity to chat with “THE Author” it’s a great privilege for us. I’m posting my response a week or two later and everyone posted amazing feedback. Many of my classmates had much of the same opinions that I thought as well…thank you for your prompt response…nonetheless, I just wanted to let you know something that no one touched upon yet and that is the idea of a project team feeling a sense of recognition, pride and shared ownership with each other is really big with me and that I would have to agree with you. My name is Z Parker. I work for the Boeing Company and I am pushing on my fifth year. Project management is something I have never heard of fresh out of undergrad. It wasn’t until I began working then I became familiar with it and it seemed like a skill that is not only growing but much needed in every industry and aspect of employment. As you referenced this in your book and your note mentioned above…”When a project begets a community it’s often because the sense of accomplishment that people have sparks that sense of recognition of each other’s expertise and people feel that they need to stay connected to each other” …. I completely agree with this. If people feel this way after a project, I would have to say the project was successful? I believe successful projects and accomplishments owe a lot to the teaming chemistry between members. Chemistry can be gained with one another when each individual within the project feels that the other person has something to offer and if what they offer is considered important. Once chemistry is developed it is only natural to surround yourself with those people that you share similarities with and have a need for. I feel that a large reason why projects become successful is because of team development and chemistry. It fuels momentum and drive to “want” to perform tasks and accomplish goals. “Even if leadership is designed to encourage and to bring along other people and engage other people, it is still the individual driving it. So, show me a leader and I will show you all kinds of followers and that is not the kind of organizations that we want. That is not the way that we build things up. I think that we need to put more emphasis on what I prefer to call, there is no word for it but I use the word ‘community-ship’, which is the idea that corporations and other organizations, when they function well, are communities. People care for each other, they worry about each other, they work for each other and they work for the institution and they feel pride in the institution. You get that in young organizations such as Google or others like this because they are growing, they are energetic, but in the older organizations we destroy it. All of the down-sizing has destroyed community-ship; it has destroyed a sense of belonging because nobody knows when they will get fired next. A lot of those firings were not because the companies had their backs to the wall, they were because they were not making quite as much profit as they were before. So, people are managing the bottom line as if it is the top line; they deem how much profit they are supposed to make and then they run around firing people to make it. Of course it has a dreadful affect on the company though. So sorry for being “late to the party.” My comment alerts are not functioning so I nearly missed the whole thread! First, I have to chime in about something in Johns wonderful post. He wrote “Nancy White kept repeating “Technology is used collectively but experienced individually,” (or something to that effect) till Etienne and I could say it on cue.” I clearly have more work to do. The line is “technology is designed for the group and experienced by the individual.” This has caused more grief in our lives than we can imagine as we create IN OUR OWN MINDS what the experience is. We often don’t take the time to sense, make meaning and discover what others are experiencing. So in some virtual teams, this is a critical issue. Second, I’m LOVING reading this thread. I used to be a facilitator for Boeing’s online First line manager training and reading comments from Boeing folk, it appears that tech use has come a long way in the past 3-4 years. Yay! Finally, in my practice, the really interesting places are the spaces between individuals, teams, communities and networks. Our ability to belong in all these spaces, ALL at the same time, across multiple technologies, is both complex, at time bewildering and pregnant with possibility. When our teams have stronger tendrils to communities and networks, I suspect they will be stronger. We may be able to keep retirees in the loop, telling stories, and probably being challenged! Thank you for letting our class take a “field trip” to your blog. 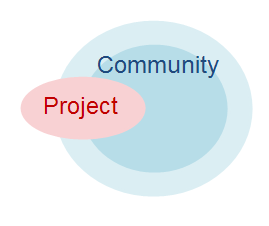 I found the relationship between projects and communities quite interesting. I have been a part of both, but never connected with the way in which each group affects the other. I find that a project group and community usually work together or one group leads the other and either succeeds or fails. An example that comes to my mind is a car. There are enthusiast groups, “communities”, out there that try to influence a company whose project is to develop or redesign a car. They enjoy discussing the highlights and changes that are being proposed. I watched a documentary about the Corvette not too long ago. During the last Corvette project when General Motors re-designed the car, the “community” was out in full force. Certain aspects of the project were being dictated by the company, such as removing the flip up lights. The community groups were outraged as these were seen as key characteristics of a Corvette. Blogs and other electronic media was allowing the “community” to be quite outspoken about changes that General Motors were making. Other challenges also existed, but General Motors changed the design to meet the needs of the “community” as best they could. General Motors certainly wanted their customers to like the new Corvette. It was interesting watching the back and forth conversation that the community put on the Corvette project team. Ultimately, the community won by ensuring some features were kept even at the expense of the project’s better judgment. If General Motors did not respond to the “community” it probably would have resulted in lost sales due to unhappy customers. First of all, thanks for the pointer to the Line and it’s shadow components. You offer a great example of the blurring between community and network, the inward facing (or attempts at control, boundaries) and the outward facing (where control is more accurately perceived as a delusion!). I am running into this tension over and over again between the “designated platform” and what people choose to use/do in the wider network. To me, it is a sign of success. Most often for the people I’m working with, it is a very scary thing. Well, it is probably both, eh? But this shift from defined boundaries to connections to broader networks, I think this is here to stay and it asks us to redefine for ourselves what we do, seek, and steward in our communities. Nancy’s points about the delusion of control and the tensions of what ought to be the designated platform (vs the accidental/incidental platform) are interesting. In a Gov2.0 sense, if the intent is to elicit perspectives that can then further inform service planning and design, then the platform where the dialogue is occurring becomes highly relevant. A closed/hosted platform is a much easier thing to be performing Analytics on to get a sense of emergent internet memes (see http://en.wikipedia.org/wiki/Internet_meme) that we need to understand to inform Service Design (knowable unknowns) in response to an expressed population need. The challenge of content discovery- to identify and respond to those memes- becomes that extra bit harder when the dialogue is occurring on those non-designated platforms. It’s like trying to listen in on a conversation that’s occurring outside a room, where you may or may not be invited. A wicked problem. As you’ve rightly identified though, conversations happen where people naturally cluster. In real-space, or a digital equivalent. Just because we create the container for a digital discussion, doesn’t mean the conversation will happen there. The conversation remains the key consideration though – it is in this exchange of ideas that we can connect with people and allow emergence of perspectives around which policy responses can be shaped. My personal blog doesn’t receive that many comments anymore as the discussion happens on Twitter…as that’s where people are at the time…the important thing is that the conversation is happening somewhere. I remember reading somewhere about the owners of Buffy the Vampire Slayer wanting to create an official online community, but it was best to let the existing fan community do it’s thing even if the new space was offering lots more features…people were comfortable where they were, and they each owned it. We have a newer CoP at work on engineering design tools. We already had a few different topic based CoPs covering different tools. The new design CoP wanted to poach those forums so everything about design tools was to happen in the one space. Not gonna happen, people are comfortable where they are, they don’t want to shift context to another CoP to speak in that forum…plus they trust the people in their current forum. I think if we were to merge them we would lose the discussion. Great all in one place, but a dead place at that…sort of thing. Classic example of control for neatness, whereas messiness is natural, so these patterns must be monitored and harnessed as Brian is doing…we have the mighty hyperlink to cross-link stuff which saves the day. Social computing is messy…just like real life most of the time I can talk about what I want where I want…I don’t have to think hang on what I’m saying is about topicX, I better walk over there and say it. This I guess is the ease of networks over group spaces, in that you don’t need to shift context…rather than a group space, it’s just a conversation space (there’s no official agenda, people emerge into the conversation, then dissipate…kind of like a random email conversation). Nancy I find this blurring between group and network at blogs. I spend lots of time on Bas Reus’s blog on complexity…a few familiar faces hang out there…sometimes you see new people, sometimes you don’t hear from others. This is not defined, it just happened, we are not a group, we just sometimes hang out at his blog if there is some juicy stuff. What’s awesome about it is that I always meet new people in the comments with amazing blogs of their own.